Taking photos for the end of the month view was bit of a struggle. We garden on a windswept ridge. A wonderful viewing point for the surrounding countryside. Disasterous for tender plants- and for taking photos. Everything was a blur as Storm Doris hit the garden. 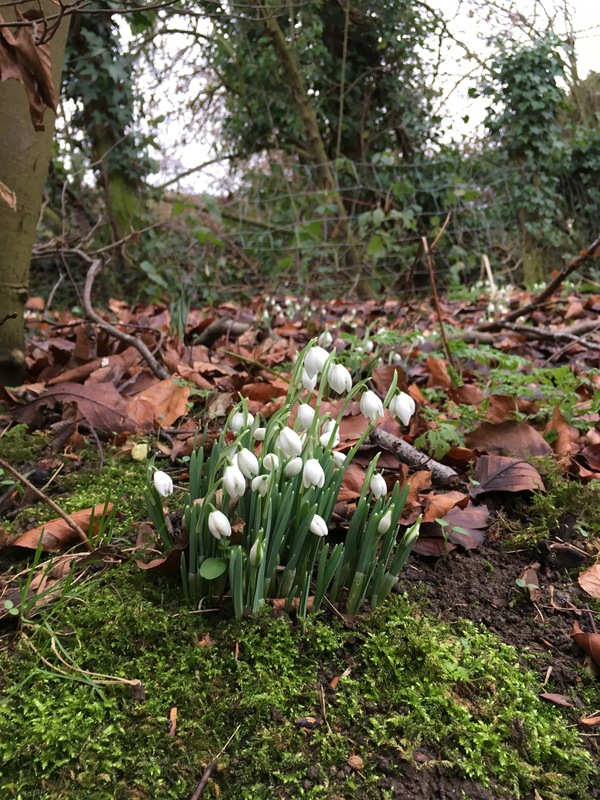 The snowdrops opened today, about a week earlier than last year. Temperatures for January varied between -6 degrees and 14 degrees. 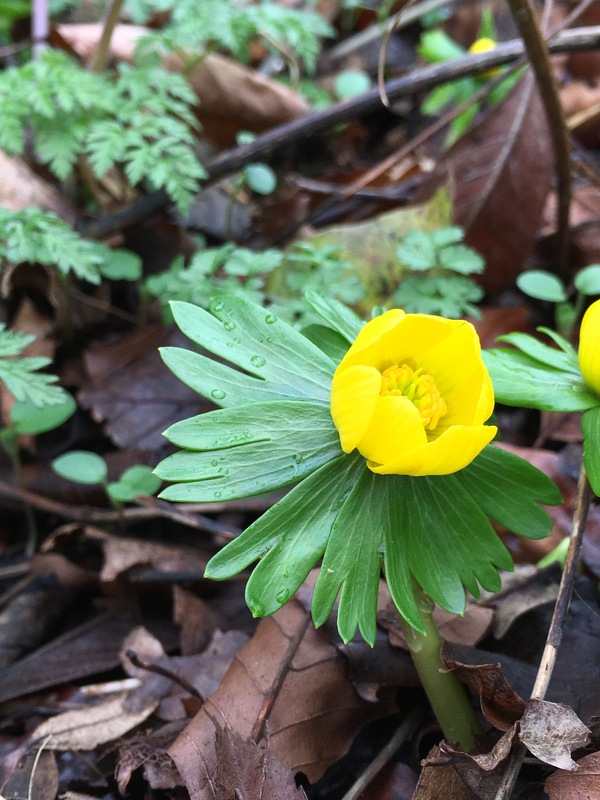 It’s caused many winter flowering plants to open early. I just hope we don’t get a cold spell now to damage the flowers. 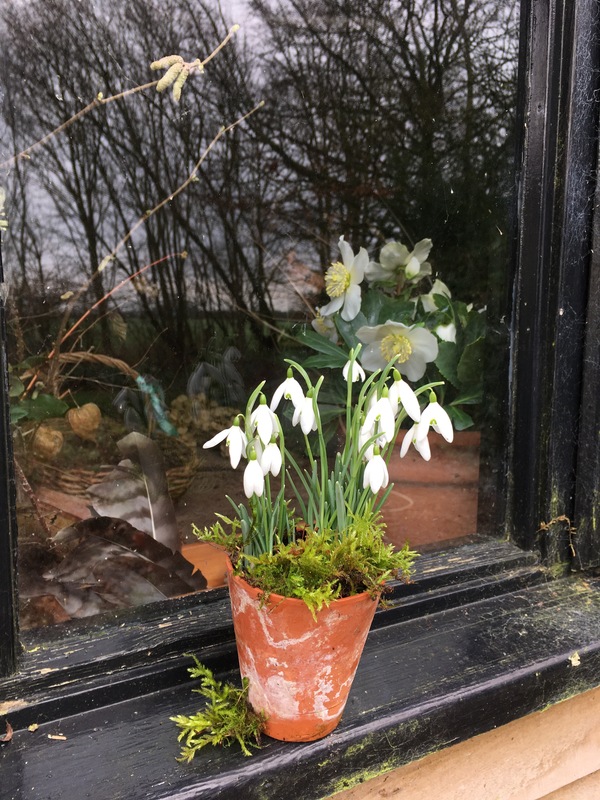 The Easton Walled Garden snowdrops are cheering up the pottingshed window. Easton, just off the A1 near Grantham, opens 11th to 19th Feb, 11am to 4pm. A wonderful place for a winter walk. I can highly recomend the little cafe where there’s home made cake and tea. Mum and I have spent many happy hours there. And I was lucky enough to work for Easton last winter, writing newspaper and magazine articles. I had no trouble finding nice things to say about this historic garden and the renovation work that has saved it for future generations of visitors to enjoy. It’s such an inspiring place. These Elwesii snowdrops have been in flower since the beginning of January. They have long stems and last well in water. I’ve been picking them for jam jar posies for the house. Mum and I bought these cyclamen from Hodsock plant sales a few years ago. They seem really happy in the leafmould in the wild garden. We just buy one pot every time we visit. They soon build up into lovely display. So cheerful at this time of the year. 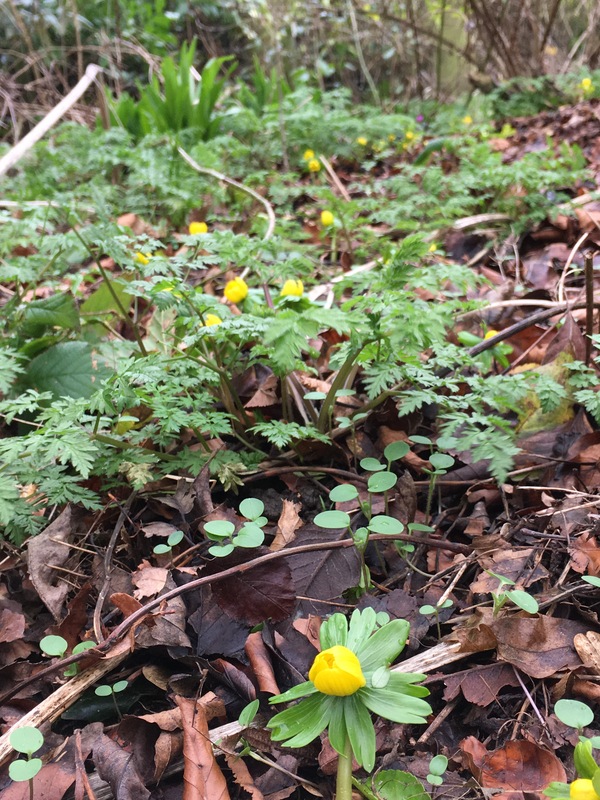 Finally, the yellow aconites have got going. I’ve been trying for years to get these to grow. They love a good mulch of leaf mould. I bought some hellebores from Ashwood Nurseries years ago. This one is a seedling from the original plants. 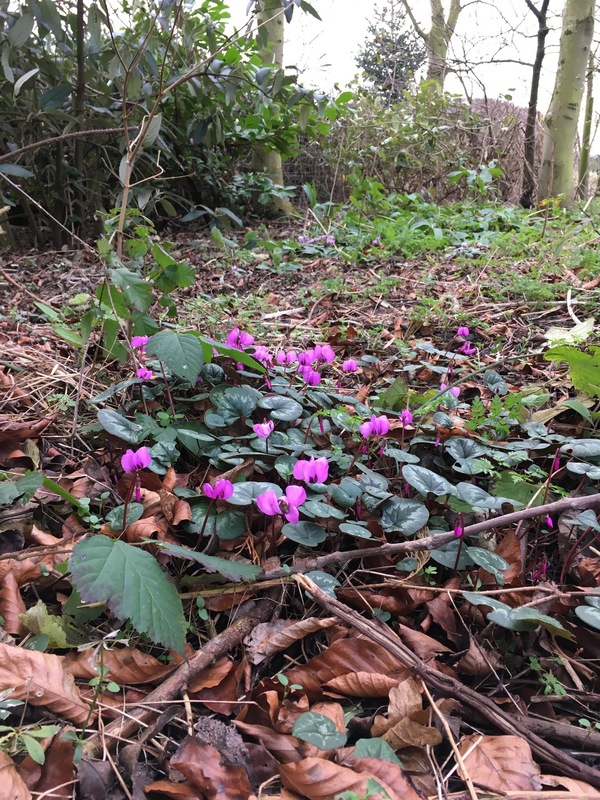 It flowers from mid January in a shady spot. I’ve been picking Phlomis fruiticosa foliage all winter for flower arrangements. The leaves look sugar frosted all year round. The star of the front garden in winter is this dogwood, Cornus Westonbirt. Brightens even the gloomiest day. Thanks to Helen for hosting this meme. Why not go over and see what’s looking good in Helen’s end of the month view. What a fantastic show to really get that spring fever started. I’m sure even with the early date they will be fine, even if it does go back to chilly over the next few weeks. I love that you have all these plant memories of garden visits, it’s great to be able to take a bit with you, and even better when they settle in so nicely. Love it. We have very few flowers in our garden at this time of year but I’m about to get some snowdripsnin the green. I like the little pots of snowdrops. I’m going to use them in the london garden. I love your blogs. Nice to see these spring flowers, Karen. 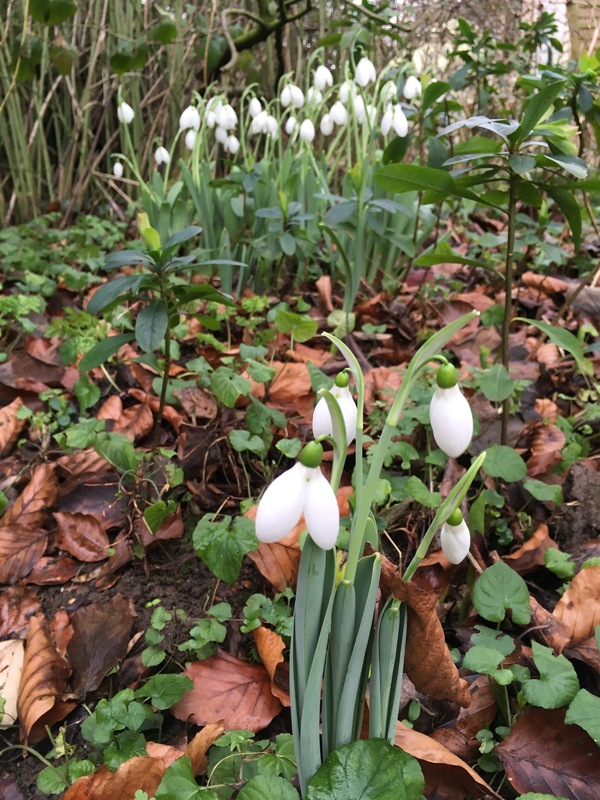 So nice to see your winter flowers, snowdrops make me feel that winter is on its way out and spring not far away. I too usually buy plants from each garden we visit, a lovely way to remember a beautiful garden. 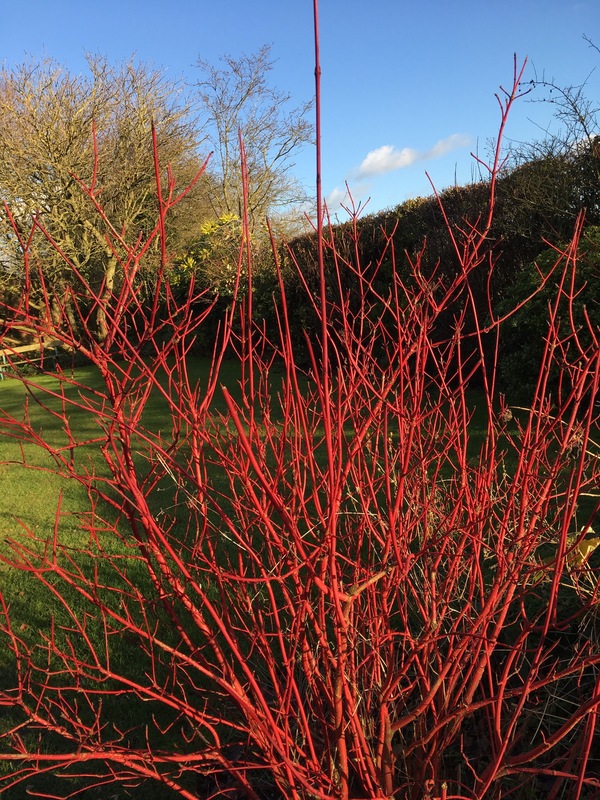 Love the red stemmed Cornus, so warming on a cold winter’s day! It really does only take a few pretty blooms to make us gardeners happy! Love the image of the Hellebore, beautifully captures. 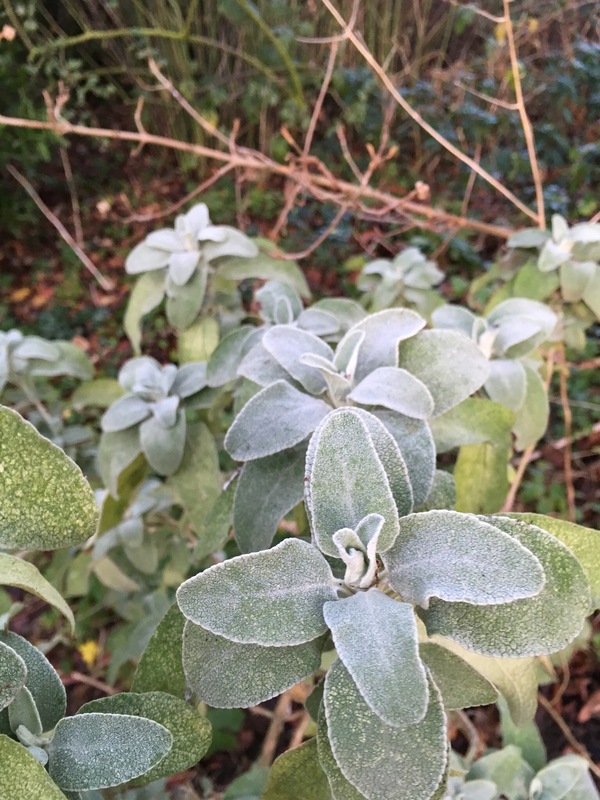 My Phlomis is a bit confused, despite the freezing temperatures it has buds. Quite a lot bursting forth in your garden irrespective of the windy ridge. I am surprised to see how far on your blooms are. Perhaps I shouldn’t be, as where we are, everything is usually 6 weeks later than the softer south. Two years ago was a recent exception, when southern UK conditions were delayed by weather, which, meant our growth was about twelve weeks later than the usual north/south horticultural divide. 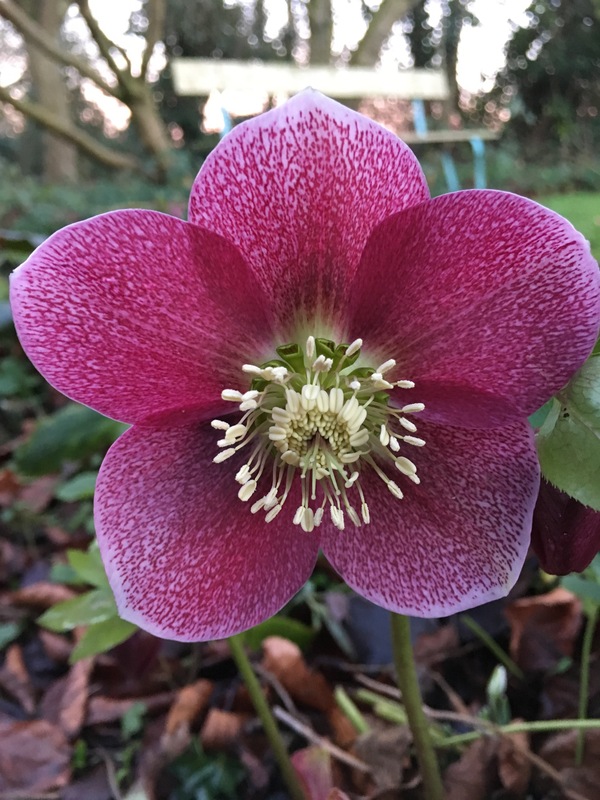 Your collection of late winter flowering plants are looking good. Both the snowdrop gardens look very impressive, unfortunately they are a little to far for us to travel to, I will have to be content with viewing via your blog. Thank you for sharing. Hodstock were kind enough to invite me to press day this year. I’m gutted I can’t go. It would have been lovely to meet you all too. Next year..
It’s great to see all the snowdrops coming up. This year I’m determined to divide some of the larger clumps and spread them about a bit. thank you for your kind comments. It was 8 degrees here today. We sat outside for lunch, with our backs against the warm house wall. Amazing for February. Now tell me, that Hellebore picture, does the flower stand proud normally, or did you manipulate it so yo could get that lovely picture? Lovely pictures, and blog, thanks for posting. Thanks for the lovely pictures!! Helped brighten up the day! So it was a press invitation for Hodsock was it? I did wonder – but no, I wan’t invited this year. When we went 2 years ago the snowdrops were barely opening as it had been so cold, although we had been the year before for a public visit and seen it at its best. The family were lovely when we met them and so friendly. I was interested to read that you had worked for Easton for a while – no wonder you are so enthusiastic about the garden. I have wondered about bees on the few really mild days we have had but haven’t seen any yet – wasn’t it lovely yesterday (Sat)?